Euphemisms, Concentration Camps And The Japanese Internment : NPR Public Editor A listener compares the internment of Japanese Americans during World War II to the Jewish Holocaust under the Nazis and raises the question of what to call the camps used in both experiences. At stake is the power of words in framing our actions, past and future. 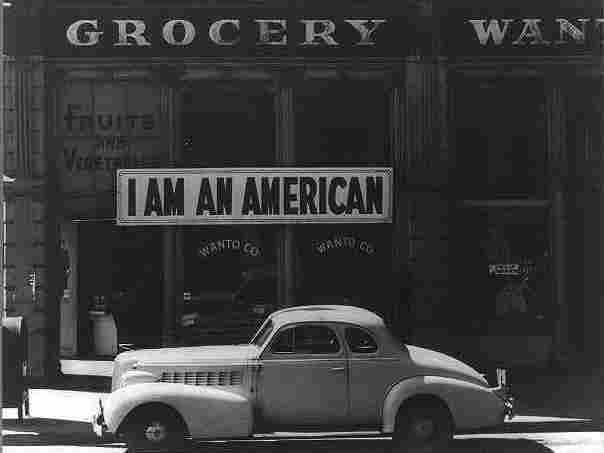 A large sign placed in the window of a store in Oakland, Calif. in 1942. The store was closed following orders to persons of Japanese descent to evacuate from certain West Coast areas. Updated 02/14 1:35 p.m. (Click for the latest): More from historian Roger Daniels. Shortly following the bombing of Pearl Harbor, President Franklin Roosevelt issued Executive Order 9066. In a climate of widespread fear bordering on panic, the order resulted in the incarceration of more than 100,000 people of Japanese descent living on the West Coast. They were uprooted from their homes and isolated in 10 hastily constructed camps, some of them for as long as four years, in what is widely known as the Japanese-American Internment. Talk of the Nation's Neal Conan hosted a segment last week about Fred Korematsu, a civil rights leader who challenged the executive order at the time. Conan's interview with Korematsu's daughter, Karen, prompted some thoughtful and even evocative replies from listeners, several of whom shared their own personal family stories. There was a story on a gentleman named Korematsu and his fight against the Japanese internment camps. The story was interesting and I felt a large degree of empathy for the family. It was nice to hear that he was being recognized for his fight against the way the American Japanese were treated. But then the commentator referred to the Japanese internment camps as "concentration camps." I cannot imagine a more offensive way to portray the situation. To compare the Japanese internment camps to the Nazi or communist concentration camps is beyond offensive to the Jewish community and any reasonably intelligent American. While not Jewish myself, I found it to be terribly offensive. Words have meaning and to diminish the term "concentration camps" is reprehensible. "Concentration camp" is a term that predates both Hitler and Communism. The Nazi concentration camps are more usually, and more accurately described as Death Camps. Stalin's Gulags are slightly different, as they were prison camps, though the "crimes" and "trials" were often specious. But a concentration camp, such as those operated by the British during the Boer War, does not in and of itself suggest atrocity. His explanation holds up with NPR's dictionary-of-choice, Webster's New World Fourth College Edition. It defines a concentration camp as, "A prison camp in which political dissidents, members of minority ethnic groups, etc. are confined." Somewhat surprisingly, "internment camp" is not listed in the dictionary. The Oxford English Dictionary supports Conan's historical explanation as well. The OED defines a concentration camp as, "a camp where non-combatants of a district are accommodated, such as those instituted by Lord Kitchener during the Boer War (1899–1902); one for the internment of political prisoners, foreign nationals, etc., esp. as organized by the Nazi regime in Germany before and during the war of 1939–45." But this debate goes beyond textbook definitions. Roger Daniels, a historian and author, wrote an analysis for the University of Washington Press called "Words Do Matter: A Note on Inappropriate Terminology and the Incarceration of the Japanese Americans." He concludes that, although it's unlikely society will completely cease to use the phrase "Japanese internment," scholars should abandon the term and use "concentration camp." He considers internment a euphemism that minimizes a tragic time in American history. As a member of President Roosevelt's administration, I saw the United States Army give way to mass hysteria over the Japanese...Crowded into cars like cattle, these hapless people were hurried away to hastily constructed and thoroughly inadequate concentration camps, with soldiers with nervous muskets on guard, in the great American desert. We gave the fancy name of 'relocation centers' to these dust bowls, but they were concentration camps nonetheless. The term "concentration camp" may once have been a euphemism for a Nazi "extermination camp," but I think that over time the two kinds of camps have become inextricably linked in the popular imagination. In other words, I believe the meaning of the term "concentration camp" has changed over time. During World War II, officials and commentators could say Japanese Americans were confined in concentration camps without evoking images of Nazi atrocities. I don't think that this is true today. But while Murray be an Asian-American scholar, the Japanese American Citizens League, the oldest Asian-American civil rights group, doesn't agree with her and sides with Daniels. It calls the camps concentration camps, and has a map of them. On Conan's program, Korematsu spoke with this Japanese-American view. So, where does all this leave us? Listener Medley, perhaps without realizing it, has re-opened a long debate. He also is right that words matter. They frame our view of the past and influence our destiny for the future. But it seems on balance that "concentration camp" is at the very least acceptable—and may be appropriate even today—in referring to the interning of Japanese Americans. What we all really seem to be seeking is a phrase that doesn't diminish the cruelty of uprooting and isolating Japanese and Japanese-Americans against their will, but also doesn't diminish the true horror of Nazi extermination camps. You may have other words to suggest in striking the balance. I appreciate you folks citing my essay, "Words Do Matter," to help explicate a semantic problem, but you have left out an important part of the argument, to wit, that while "concentration camp" is the preferred term it is not mandatory. What is, in my view, mandatory, is not to use internment. The United States, and most other powers, did intern "enemy nationals" something recognized in American law, and kept them in generally well run camps run by the Department of Justice. To confuse those camps, which conformed to the Geneva Convention, and, in the United States were limited to what the American statutes referred to as "alien enemies" 14 years of age and older, with the camps set up under Executive Order 9066 which incarcerated primarily American citizens of all ages is to muddy the waters quite seriously. The government did not have to apologize for those selected individuals place in DoJ internment camps. It did apologize, and paid serious compensation for those confined in the camps run by the War Relocation Authority so well described in the quotation by Harold L. Ickes. Your use of "internment" shows that you don't yet fully understand the issue.